Porcelain Fused to Metal Crowns (called PFMs) could be called the “workhorse” of dentistry. PFMs begin with metal casting using a precision impression of the tooth. The metal can be precious, non-precious or semi-precious. Porcelain is then fused to the metal. If the crown margins (edges at the gum line) fit tight and the tooth has been prepared well, PFMs can serve the person well for a decade or more. The American Dental Society (ADA) considers the lifespan of a PFM to be five years, but the reality is that many PFMs survive much longer, sometimes as many as 20-30 years. The longevity of the crown is dependent upon such things as home care (i.e., brushing and flossing), stability of the tooth and condition of the root. Because PFMs have a metal lining, they stand the rigors of chewing and bruxing (grinding the teeth, usually at night) quite well. The downside to PFMs is cosmetic. While the crowns can be color matched to the person’s natural tooth color, the end result is an opaque crown, that upon close examination can be easily identified as a PFM. 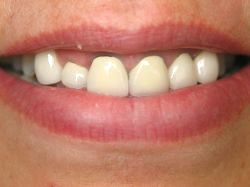 The dark line at the gum line is the signature characteristic of PFMs. Often insurance companies will only pay for a Full Metal Crown (called FMCs). A FMC is the same product without the porcelain added. The picture at the right here is an example of PFMs that have been used to restore the front two teeth. As you can see, it is difficult to overcome the opacity of the metal. Northgate Dental does not recommend PFMs for cosmetic purposes.